John Galliano put on the most striking and touching show of the Spring-Summer 2006 collections. 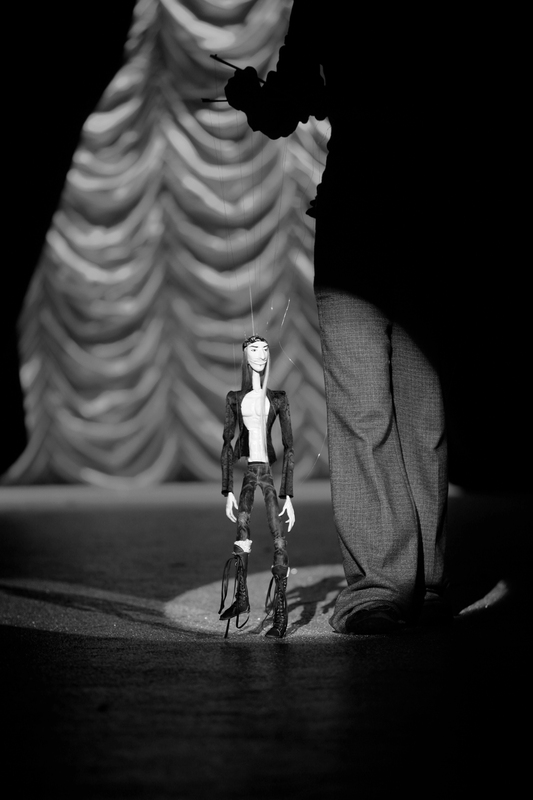 Before taking his final bow, a puppet of the creator appeared on the runway to take it for him. Was it a critique of the societé du spectacle that he brilliantly incarnates in the fashion world, or is it just his latest metamorphosis? This unique show was a moment that left us curious to meet the designer behind the showman. OLIVIER ZAHM — It’s rare to see such an emotional show these days, I’m not the only one who was moved. What was this show about? JOHN GALLIANO — The inspiration came from a trip I made to Buenos Aires, Argentina, in particular a very poor district called La Boca. The mayor of that district encourages the inhabitants to paint their buildings as a very colorful and naive way to attract tourists. OLIVIER ZAHM — It’s near the port? JOHN GALLIANO — It’s near a part of town that they are completely rebuilding. It’s a bit like a new Covent Garden, as if in the throes of refurbishment. It was a very exciting place to be. OLIVIER ZAHM — Why did you go there? JOHN GALLIANO — To learn more about tango. I had a vision of what tango was, so I went there to learn more. And like many research trips, it took a long time to start to see the real Buenos Aires and to get past the tourist version of tango, you know, the commandante, the dinner tango, etc. I did it all because I wanted to make contacts and meet the right people. I thought, it has to exist. Eventually we made some contacts. It’s a bit like rave parties, they don’t announce anything. It’s all by word of mouth or by mobile phones. And things happen in beat-up old places, which is why they don’t announce things. Often they are quite dangerous. OLIVIER ZAHM — What kind of places did you discover? JOHN GALLIANO — To make a long story short, we had this magnificent old townhall that looked like Basquiat’s studio. It was amazing. The roof was completely destroyed and the moon was shining in on us and wild cats ran around and lo and behold we went in and there were all of these hip-hop kids and these incredibly elegant old men, 70 to 80 years old—white hair, gorgeous. It turns out that it’s the older generation who teach the new generation how to tango. I love this juxtaposition between ages and sizes and a whole generational thing being passed down before our very eyes which is wonderful, wonderful. OLIVIER ZAHM — Even the hip-hop generation is dancing tango? JOHN GALLIANO — Yes! Which is why I started to trip: guys with hoodies were dancing with these men, and I thought, We’ve arrived. This is what I wanted to see. Now we need to film it. Of course we weren’t allowed to. So we got on the track, on the groove, and we were invited to another one and we went in with a camera hidden under a jacket, and filmed a moment that was amazing. So that was the first inspiration for the last collection that you saw. OLIVIER ZAHM — It was a party? JOHN GALLIANO — They’re secret, like a rave. You know when they used to have raves, you would never know the addresses. You would hear abouty it by word of mouth, and it would be in an unused building. OLIVIER ZAHM — Is it a spectacle that you are part of? JOHN GALLIANO — You go in there and you see the couples teaching each other—a man with silver hair and a young chick maybe sixteen years old. It was wonderful for me. It was like a ball. There were many wonderful things that happened in Argentina, but that was really the starting point for that last collection. JOHN GALLIANO — We wanted the show to have a slightly artisanal feel. We’ve done the hi-tech, and I wanted something lo-tech, artisanal and honest, which I thought would be the perfect backdrop for my story—which was inspired by Ken Russell and a film called The Boyfriend. It was kind of handmade and full of mistakes, with people walking in the wrong way with their backs turned and, for a change, very lo-tech, which I thought quite interesting. There were people pulling ropes and string and deconstructing that whole polished thing. OLIVIER ZAHM — Was that also why you decided to mix glamorous models with all kinds of people? JOHN GALLIANO — They were all glamorous, darling! They were probably the most in touch with their inner luxuries than you or I will ever be. They were themselves. Happy in their skins. They weren’t trying to be anything other that what they were, and that to me is the supreme luxury and glamour. Personality and character. To have that is so much more interesting than the rest. So the casting started and we worked on the collection simultaneously with the show. We worked with wonderful models and characters. They came to castings full of joy, so natural and fantastic that I started to feel like I was on a God-sent mission to do this collection. I really did. I had no worries at all. People asked me if I was worried. But no. Not at all. It was one great big happy family. Some of the ladies said they’d been waiting for twenty five years to do a show like this. Some of the little people asked me if I was sure I wanted to do it. “Yes,” I said. “You’re gorgeous!” And they were. Their personalities came shining through. OLIVIER ZAHM — You also had to do the fittings on them. Did that change the working process? OLIVIER ZAHM — How did you find these beautiful people? JOHN GALLIANO — Some were friends. Some I found through friends. There was the fabulous Marie Sophie Wilson who used to be a model. When I first came to Paris she really looked after me and I stayed at her house. Dragna was a model too. OLIVIER ZAHM — It was spontaneous? JOHN GALLIANO — Yes, they call it a “subversive casting.” There were quite a few actors. Everyone was quite used to that. They were glamorous and flamboyant and proud, because a lot of them were performers of different kinds. But there were regular people too. OLIVIER ZAHM — I really enjoyed the John Galliano marionette. What was that supposed to be? Were you critizing the fashion system? JOHN GALLIANO — It didn’t mean any of the deeper thoughts you might have, other than the fact that we had an incredibly talented intern who made these beautiful puppets, so we thought to make one of me. Then we thought it would be great if the puppet could go out on the runway and take the applause for me, and even do some interviews for us. It started like that: they created the puppet and one day it walked in with a bandana on his head. OLIVIER ZAHM — Do you remember the kids entertainer Pee Wee Herman? He had a puppet of himself that was a huge success, maybe you could do the same. OLIVIER ZAHM — Let’s speak about love. The show was all couples, and you said, very nicely, in the French magazine, L’Express, “Derrière chaque romance, se cache une tragédie” [Every romance conceals a tragedy.] Was there tragedy in this show? JOHN GALLIANO — Humanitarian issues. We were trying to touch issues of age and size. People have done it before, but not as seriously as we did: not from A to Z. We were very serious about it. We worked with the commercial department as well, and we told them it was going to be a statement and asked for their support, and asked they offer the dresses in larger sizes. They said if people showed interest, they would support us. That was step one. OLIVIER ZAHM — To break the conventions of what is a perfect body? JOHN GALLIANO — I was reminded the other day about the percentage of orders by size. Most clothes, as you might think, are ordered in medium or size 38, but size 44 is still 14% of our order—which is a reality. We go up to size 44, we do 46. We cut our dresses on the bias which creates a natural stretch. So even if you are a bit more voluptuous, you can look glamorous. It’s something that has been there, it’s just that this collection has addressed the issue directly. OLIVIER ZAHM — What about the show itself? Your shows are always spectacular. How important are they for the collection? JOHN GALLIANO — It’s one of the important things. If we are talking about John, at John Galliano, I don’t have the advertising budget that Dior has. So that twelve or fifteen minutes is crucial as a backdrop to show to my buyers and to the press the Galliano collection for that season. It’s crucial as a backdrop to help sell the collection. OLIVIER ZAHM — Are you frustrated that after a show, what you see in the magazines is only a silhouette? JOHN GALLIANO — What we try to do—and it’s not so much a frustration—is to approach a photographer who will come backstage and do a special story. Because you will never see this girl look like that again with the hair by Orlando, the makeup by Papas, styling by so and so—you will never see this moment again. Nick Knight did the last show and he wouldn’t leave. He stayed for a week, with all the characters at the Ritz and around Paris. He filmed the whole thing which is amazing, and then we did a story with French Vogue. That’s also one of the reasons a designer does a show: it’s the only opportunity you have to show your point of view, what you think and how it should look. Of course the clothes are up for interpretation. I love it when people take the clothes and are irreverent with them, and reinterpret them and wet them or put them on upside down, whatever. That tells you a different story. I wish they would do it more. We have all become so politically correct. I used to like it when people would put things on upside down or inside out or went into the sea wearing them, or put mud on them. They’d send back a ball gown in a plastic bag in a state that would make you gasp. I’ve even cut up things on a shoot to make a better image. OLIVIER ZAHM — Everyone sees you as a British designer, but actually you were born in Gibraltar. Do you secretly feel that you are a Spanish designer? JOHN GALLIANO — Being born in Gibraltar means that you are British. They have British telephone boxes and British policemen, and the British pound. It’s a British colony. But my mother is Spanish and my father was from Gibraltar. So of course I’ve had a huge Spanish influence. When I was a child, until the age of six, the frontiers were closed, so I went to school in Spain. I had a very colorful childhood. OLIVIER ZAHM — Did your mother dress you and your sisters very impeccably? JOHN GALLIANO — Ritualistically. But very simply. We were bathed, our hair was brushed, and she would use talcum powder and this child’s perfume called something like Ninco. One would be prepared, and then the next and so on, even just to go to the corner shop. It was very Spanish. OLIVIER ZAHM — Did you feel differently from the other kids around you? JOHN GALLIANO — With my perfume and my rosaries? No, because it is very much part of the Spanish culture. Boys are created by their mothers. In most Spanish cultures vanity is not bad, it’s a good thing, a healthy thing. It’s respectful to other people too. That might be why I feel so uncomfortable today [Laughs]. It’s out of respect. OLIVIER ZAHM — Now that you’ve left London and have been in Paris for 15 or 16 years, do you feel like you’re a Parisian? JOHN GALLIANO — I don’t really know what it means to be Parisian. I don’t know if I have the makings of a real Parisian. I’ve always felt a bit like a gypsy, and I still do. I felt comfortable in Paris immediately, and have had great support here. I didn’t ever feel like a foreigner. Coming from Gibraltar I was used to good food and wine, so nothing was really alien. I wasn’t really English either. So it was an easy transition. The only thing I missed, when I first came here, was the music. I didn’t understand why the radio didn’t play all the top ten hits all the time—why after every one disc from the 60s there would be seven French ones. And why I would go to these amazing clubs and once the music reached a certain decibel, the club would be finished. You would go the next week and it would be gone. London was always about music, work, and play. But I’ve become quite used to Paris. Actually, I quite like silence. Sometimes it’s nice to go home and eat, and not go to a restaurant. Otherwise the noise doesn’t stop. I was always going to restaurants just for ease, and because I can’t cook. But the sounds, the bells, didn’t stop until I went to bed. I thought I should do something about it. It helps not to have to go out every night. OLIVIER ZAHM — Where does your pirate fantasy come from? JOHN GALLIANO — It’s something I’ve been called, not something I’ve fantasized about. I’ve always worn a bandana or an earring, and from very early on I had a moustache and looked a bit like Errol Flynn. It’s one of those things that stuck. I do love to travel though, and to plunder uncharted territory [Laughs]. I’m more like a Peter Pan pirate. Whenever I’m in Hyde park I go to see the Peter Pan statue and touch him and make a wish with Wendy. OLIVIER ZAHM — I love that your look is not separated from your own fashion. JOHN GALLIANO — It’s part of the creative process. A lot of people have asked if the stylist comes in and does a look for me for the show. But no, it’s totally unconscious. Petit à petit, as you are working on a collection, whatever the inspiration is, I start to live it, to breathe it, to drink it. It may start with myself. When it comes to the collection, I am in character. I totally immerse myself, as an actor would. OLIVIER ZAHM — I don’t really like designers who design extravagant clothes but only wear jeans and a T-shirt. JOHN GALLIANO — And who don’t live it. OLIVIER ZAHM — What about your collaboration with Nick Knight—one of your favorite photographers, and now shooting the campaign for Dior? JOHN GALLIANO — Nick used to be the quintessential English skinhead. He did a great book called Skins. I knew Nick from before I even came to Paris. He used to be a photographer, on the street, shooting kids for I.D. magazine. I was one of those kids. He was a kid too, we are about the same age. I remember him shooting me and my friends Barry, John and Seville, who is back in Paris and used to work for me. That’s how I first met Nick, capturing interesting characters on the streets in London. I was always a fan of his work and we kept in touch and collaborated on projects for magazines. But the first major collaboration was for Dior. I thought that he was the only person that could help me express the image I wanted for the House of Dior. He’s also responsible for changing the image of Dior, through the work that we did together, and the use of a certain lens that gave a very illustrative quality to the girls. We developed Dior skin, the shine on the skin, the wind in the hair. The rest is history. OLIVIER ZAHM — The pictures are like a painting. JOHN GALLIANO — Absolutely. When you see the picture of Kate, there are 50 shots of her with the best hand, the best face, the best hair, just to make the most beautiful, arresting image—one that screams off the page. We wanted that dynamic color and movement. Nick does fantastic images on his own, shooting balloons full of powder with bullets going through them. It’s amazing what he does. OLIVIER ZAHM — You have a gazette print for John Galliano that I love. You use it as print and as an image. JOHN GALLIANO — It’s become a John Galliano code. We use it as an image, as packaging, as lining. It’s on the clothes too. It’s inside the shoes. You can read it too and it’s all factual. It probably needs updating now. And some of those clubs probably don’t exist anymore. It’s funny and gives advice to girls about fashion. It’s informative and has a culture now. I don’t know exactly how it came about. I’ve always had a fascination for newsprint, and have always played with that element in some way or another. I like the very raw and savage mixed with something very elegant. I think originally it was from The Financial Times, and the image of a gentleman carrying a pink newspaper. That was initially the inspiration. Then I did it as prints and it developed from there.